Johnny Appleseed was a contemporary of the more traditional Founding Fathers. Although his participation was not political, he still helped grow the young United States. Appleseed assisted in building the apple into a staple of the American diet as well as teaching the people about conservation. John Chapman was born in Massachusetts at the same time that the First Continental Congress was taking place. By age 18, Chapman decided to venture out on his own, traveling first to Pennsylvania, then to the Northwest Territory (today's Ohio, Indiana and Illinois) as well as small parts of Canada. Chapman lived like an itinerant preacher. This was the same time as the Second Great Awakening, where most of the population of the young United States found themselves in a religious fervor. Many new and interesting churches gained a following. Chapman, for his part, converted believers to Swedenborgianism (AKA The New Church). In short, he believed that Jesus Christ was not just the son of God but actually God himself. Additionally, since God was goodness itself, being good made you one with God. (This is an extreme oversimplification of an entire religion, I know, but this is a Founding Fathers article not a religious text). It was during these travels when Chapman gained his nickname: Johnny Appleseed. Although our modern interpretation is of a man skipping through the woods, scattering apple seeds everywhere he went, the truth is much more sane. Johnny would plant orchards on farms, returning each year for pruning and upkeep. The owners of the orchards would sell the apples for profit and pay Johnny for his service. Although his orchard business returned a modest income, Appleseed lived the life of a pauper. He walked the land barefoot and dirty. Part of the legend of Johnny Appleseed, which turns out to be true, was that he wore a pot for a hat. He would use this pot to make his meals and, presumably after it cooled, would pop it back on his head. Passing away just after James K. Polk became president, Johnny Appleseed planted orchards for the entirety of the first ten Presidential Administrations. As this was during a time of westward expansion (the Northwest Territories being considered the west), Appleseed was a pioneer and trailblaser in this part of America. As the area he helped to feed soon became the first 'new' states entering the Union, Johnny's work was important to the success of these areas. A mythological figure in his own time, Chapman spread apple orchards across the Northern United States. He assisted in building the reputation of the apple as a truly American food. As the old saying goes, there's nothing more American than apple pie. If you want to learn about Johnny Appleseed there are hundreds of children's books you can read. If you want to learn about John Chapman I suggest you pick up 'The Man, the Myth, the American Story.' 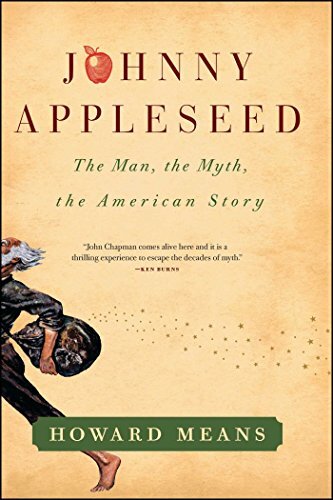 One of the only Johnny Appleseed books for adults, this book gives you a realistic biography of the American Folk Hero. Links on this page go through our affiliate Amazon.